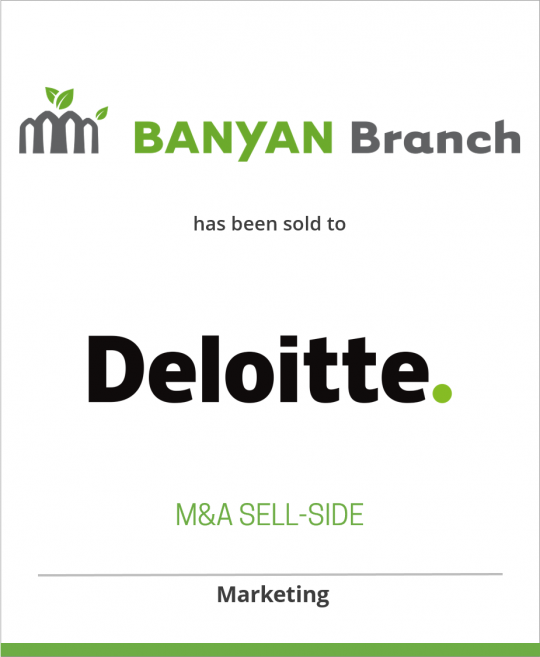 DeSilva+Phillips client Banyan Branch, a leading digital and social media agency, has been acquired by Deloitte. Based in Seattle, Banyan Branch offers clients audience-powered, digital marketing solutions through a full suite of services, including: social analytics and insights, community management and digital creative. Terms of the deal were not disclosed. The Banyan Branch team will join Deloitte Digital, a part of Deloitte that combines creative services with trusted business and technology sense to design and deliver digital experiences for the world’s leading brands. The acquisition is a continuation of Deloitte Digital’s strategy to offer clients access to a full-suite of digital marketing services, bolstered by Deloitte’s vast business and technology services and capabilities. Banyan Branch was founded in 2007 and has grown under the leadership of Alex Garcia, Dave Hanley and Alicia Hatch. All three will continue in leadership roles within Deloitte Digital, helping to redefine the future of marketing through social engagement. From strategy to delivery, Deloitte Digital combines cutting-edge creative services with trusted business and technology expertise to design and deliver digital experiences. Whether consumer or enterprise, we deliver strategy, mobile, social, eCommerce, digital marketing and design solutions that help strengthen our clients’ brands and evolve their businesses. Deloitte Digital is a part of Deloitte Consulting LLP. Learn more at www.deloittedigital.com. As used in this document, “Deloitte” means Deloitte Consulting LLP, a subsidiary of Deloitte LLP. Please see www.deloitte.com/us/about for a detailed description of the legal structure of Deloitte LLP and its subsidiaries.